Introducing Contributor by Google —an experiment in additional ways to fund the web. Contributor uses Google’s existing ads infrastructure to show visitors thank you messages in the ad slots on your pages. Contributor bids for these impressions in the Google ad auction using an algorithm based on the user’s monthly budget. The system that makes Contributor work is the same auction system used by advertisers to run advertising on the web. Instead of bidding on behalf of an advertiser, Contributor bids on your behalf, with the budget you set up. The Google ad auction determines when a thank you message will appear in an ad space, and how much it will cost. In the ad auction, advertisers and Contributor bid for a given ad space in real time. Advertisers specify criteria that must be met, along with how much they are willing to pay to show an ad. An ad space might be more or less valuable to an advertiser depending on a number of factors, including what site it appears on, where a person is geographically located when they visit a page, even time of day. The maximum amount that Contributor bids on your behalf for a given ad space depends on a number of factors, including your remaining account balance for the month and the cost of the ad spaces where your thank you message has shown in the past. If Contributor does not have the highest bid, you pay nothing for that ad space. The Google ad auction uses the same logic as DoubleClick Ad Exchange. 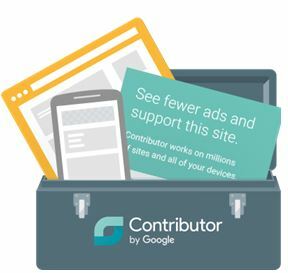 Visitors who have signed up for Google Contributor will see a thank you message in some of the ad slots on your pages, which may be accompanied by a pixel pattern. The addition of Contributor users as buyers in the ad auction increases the auction’s revenue potential. Therefore revenue for publishers can only change for the better. Right now, to sign up for Contributor users must have a U.S. billing address. Regardless of what country the publisher (or user) is based in, Contributor will work on a site—as long as the user’s billing address is in the U.S. We’ll soon be expanding eligibility to work with billing addresses in other countries.